This refreshing recipe works for breakfast or dessert. You can also use either local or seasonal fruit. Topping with granola is optional! Great for breakfast or dessert. You can add your favorite fruit to the recipe or top your Parfait with granola! Whisk heavy cream, powdered sugar and vanilla to form whipped cream. Mix yogurt with honey and layer a tbsp in each cup. Arrange a layer of pineapple, then top with more yogurt, add banana, then more yogurt,and top with strawberries. 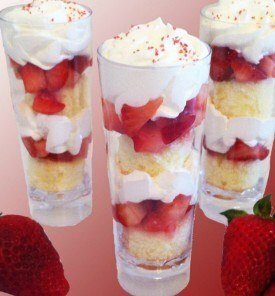 Top with homemade whipped cream and serve!